Liverpool is getting a new five-floor Beatles Museum on Mathew Street . Beatles Radio: The Beatles, Solos, Covers, Birthdays, News The Fab 4 and More! Created by Roag Best, brother of 'fifth Beatle' Pete, it will tell the story of band's history through 300 items from his personal collection. 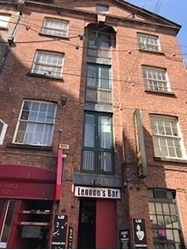 Magical History Museum will take up five floors of the building - at number 23 Mathew Street, next to the Grapes pub - which has been completely gutted and refurbished. Roag said: "It's going to blow people's minds. "We will be taking people on a journey though the Beatles' career but unlike any other museum before it, every part of the journey will be accompanied with memorabilia. "Many things they will never have seen before, others they will have seen back in the day but not for many years." Objects include George Harrison's Futurama guitar, John Lennon's Sergeant Pepper medals, the cello from I Am The Walrus and Pete Best's Premier drum kit.